White Hydrangeas have clusters of small 4 point shaped flowers. 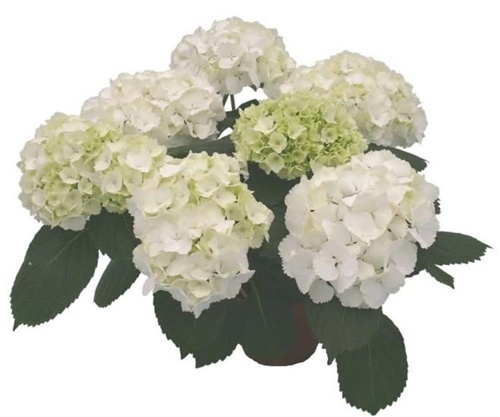 Our fresh cut hydrangea flowers have a large blooms that can used by themselves or with other flowers to create beautiful, long-lasting wedding bouquets & floral arrangements. Free Shipping! Premium White Hydrangeas have a single bloom, a globe composed of numerous clusters of small four-petaled pinwheel flowers. Premium White Hydrangeas have a single bloom, a globe composed of numerous clusters of small four-petaled pinwheel flowers. They are available year round from our partner farms in Colombia and Ecuador. Hues may vary with where they are in the growing cycle, time of year, etc. Sometimes you will find them with hints of pink or green. Like snowflakes, Mother Nature makes no two hydrangeas alike! Premium Hydrangea globes 5 to 9 inches diameter.